When you have sad news to give, use this strategy to ease your way in. As I pull into the driveway preparing for the moments to come, I think about the many times I’ve delivered the news, “I’m so sorry, your loved one, is gone”. I ring the doorbell and Mr. M’s wife opens the door in her bathrobe and slippers. From the entrance, I can see Mr. M in his hospital bed at the far end of the living room, just in front of the large picture window facing the pretty snow-covered woods beyond their backyard. A small bedside lamp and the dawn light, illuminate his body. I can tell, even before slipping off my boots, he is dead. Each time I have to give this kind of news, it’s unique. No one person or family is the same and even though I’ve given the news lots of times, they haven’t heard it lots of times. In fact, for this one person, they’ve never heard it before. So, the first thing I do is take my time and use a pattern of listening and guiding I learned in my hypnotherapy training called “pacing and leading”. Pacing and leading is a pathway to developing rapport. But this kind of rapport is beyond your everyday common, “Hello. How are you?” This is an advanced level of connection that’s building your relationship with someone, especially someone you don’t know well and don’t have much time with, on the spot. Pacing is aligning your body posture, your tone, the cadence of your speech, with the person’s, and even includes their perceptions. It’s forming an alliance by carefully stepping into the conversation from where they are, for what is true for them. Leading is that moment, when you take the reins, lightly, as the guiding doesn’t have to be forced or coerced. It’s nuanced, with a look, a soft question, and a sense that the person is able to take the next step and follow you where you are taking them. It requires a skill set that we do have as health professionals, but don’t always use in the midst of being busy and thinking about multiple things at once. It’s also because we can be uncomfortable with not knowing how the person will react. Using the rapport developed with pacing and leading, though, you are always side-by-side with the person. Recognizing that they are also in charge, you can rest on the wisdom of their own capacities for coping. The goal being, when two people come together in an unwanted, but necessary moment, is to find the most beneficial pathway toward your common purpose of caring, healing and the giving and the receiving, of sad news. In my stocking feet, I slowly walk over to Mr. M. His wife walks parallel to me, but stops and stands in front of Mr. M’s recliner, off to my right, just in my peripheral vision as I take a good look at Mr. M.
Mr. M. is quiet, his face grey, eyes closed, cheeks drawn, lips bluish, chest still. He’s tucked sweetly under an old light blue comforter, the crisp top sheet folded evenly under his chin. I rub the drum of the stethoscope against my palm, gently lift his cool hand and check for a pulse. I listen to his heart and lungs. Silence. Except for Mrs. M’s breathing and the morning birds awakening. I listen for a full minute. It’s true that I’m not only thinking about Mrs. M. I’m remembering the many deaths I’ve attended, especially that of my late wife. I’m not nervous, or worried or lost in sadness. I just wait, grateful I know the full weight of sorrow. It’s then that I look up slowly from Mr. M, over to Mrs. M. She hasn’t moved, her hands clasped in front of her chest. She is looking at me expectantly and so I say, “I’m so sorry, he’s gone”. I’ve learned people really need this time to adjust. They need to feel our respect, care and appreciation that their world is about to change radically. And that, by our pacing we join with them, and by our leading, they know they are not walking into the next journey without skillful guidance. Giving sad news or having a difficult conversation isn’t easy, but being in alignment and connecting with pacing and leading can help ease the way. I’d love to hear what your thoughts are and if there are other strategies you use in these situations. 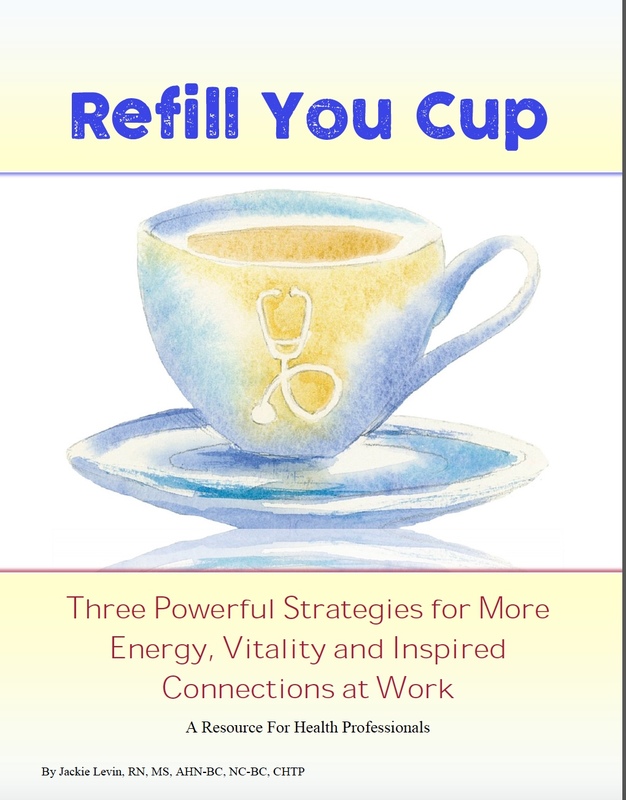 PS: If difficult conversations, giving sad news, or just the everyday kind of challenges are draining you, please download my eBook Refill Your Cup. I really can’t emphasize enough, how important it is to take good care of yourself along with taking such good care of others. Download your free copy now and give yourself those essential “sips” of caring for yourself so you can give from a full cup. Beautiful, and such great advice. I know first-hand how we as practitioners can become complacent and numb to this life-altering event for the family or loved one. I always try to remember that and put myself in their shoes when present this gut wrenching news. Working in the ICU, this unfortunately is a responsibility and task I do quite often. More often than I care to admit.